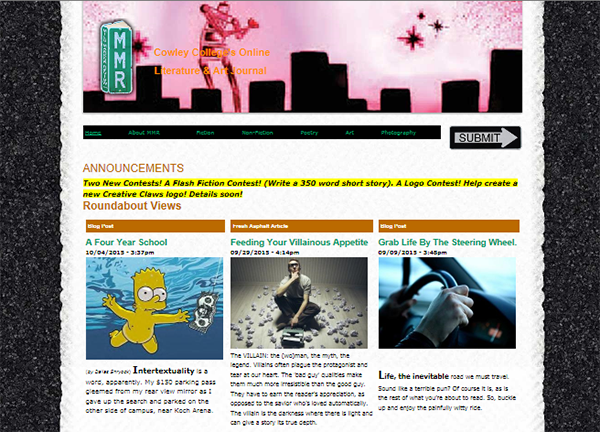 Mile Marker Review is an online literature, photography, and art journal published by the Creative Writing Program at Cowley College. Mile Marker Review is an online journal published at www.milemarkerreview.com. If you are interested in submitting your work for publication in the next Issue of Mile Marker Review, go to www.milemarkerreview.com and read the instructions for submissions. Cowley encourages students to develop their creative writing skills as a form of self-expression and a means of communicating emotions, ideas, history, and perception of the world and the human condition. The creative writing program provides opportunities for original compositions in various genres: poetry, short stories, non-fiction features, children's literature, dramas, and character sketches. Some students may even investigate potential publication of their best work in literary venues. Art students at Cowley have the flexibility to incorporate into their program the types of work they are interested in, while learning the basic fundamentals or execution and design. Students are encouraged to take on special design projects for the college and other groups, in addition to work done for themselves such as designing and selling personal work. Art students show their work in displays on campus and at special college events. The art program offers an introduction to various artistic media. Drawing, design, painting, sculpture and ceramics are courses that illustrate the artistic diversity to students. General education courses such as art appreciation, history, literature and problems in art help round out the art major's years at Cowley. Elective courses give students an opportunity to construct individualized programs. The Mass Communications program combines classroom experiences and hands-on involvement, including the chance to contribute to a bi-weekly newscast and The Cowley Press student newspaper and its corresponding online edition. The curriculum includes courses in photography, broadcasting, news reporting and public relations, as well as opportunities for training in advertising and multimedia presentations for the web.